Supermassive black holes (SMBH) have been found in the centers of many galaxies. The supermassive black hole mass is known to correlate well with global galaxy properties like the stellar velocity dispersion or the stellar mass. 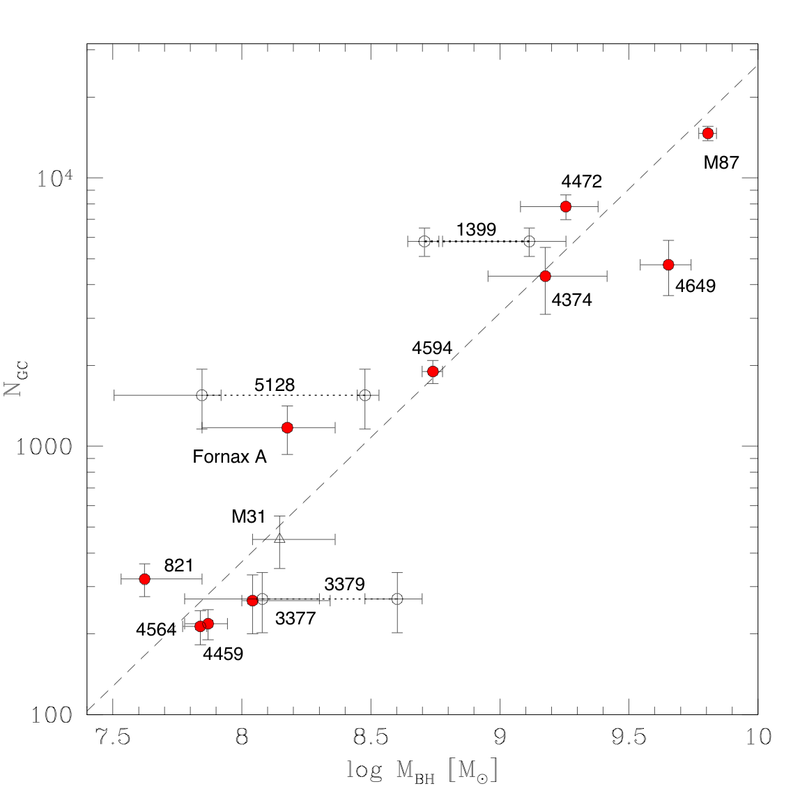 Recently Burkert & Tremaine (2010) found a new, surprisingly tight, linear correlation between the SMBH mass and the number of globular clusters in galaxies. This correlation is tighter than any other correlation, including the famous black hole - sigma relation. To a good approximation the total mass in globular cluster stars in a galaxy is equal to its central SMBH mass. The original sample of BT10 was based on 13 early-type galaxies. It was recently extended to 33 galaxies by Harris & Harris (2010) who confirmed the tight, linear relationship and showed that the correlation holds also for spiral galaxies while it appears to fail for S0-type galaxies. The origin of the correlation and its implication for the combined evolution of black holes and globular cluster systems is not understood up to now.